hanelyp wrote: Under a federal government shutdown, it would nominally be on State and local governments, and prepared citizens, to keep order. Hopefully local police will give rabid democrat mayors the big middle finger if ordered to stand down in the face of rioters. If not, being on favorable terms with some well armed Korean shopkeepers would not hurt. In 2008, state and local law enforcement agencies employed more than 1.1 million people on a full-time basis, including about 765,000 sworn personnel (defined as those with general arrest powers). The police would then be badly outnumbered nationwide if any significant fraction of the cut-off food stamp recipients went rogue. So with the National Guard/Army effectively sidelined by the hypothetical government shutdown, yes hanleyp it would likely fall to "prepared citizens" such as they are to attempt to back up badly outnumbered overworked LEO to try and maintain some semblance of peace in such a situation. Can't say I am optimistic how that would favorably play out at least not until allot of pain & suffering happened. Which takes me to my second point are you a "prepper"? Do you mean do I have an underground bunker, years of food, hundred thousand rounds of ammo, a rogue radio station. ?The ability to survive an asteroid strike, and extinction level event, a nuclear war, The fast answer that is no. Do I keep an extra supply of food in the house ? Have a generator for power failures? Let the means to defend myself and my family? Yes and emphatically yes. I follow the mindset of Robert Heinlein and believe specialization is for insects. On a personal level my wake-up call was the Katrina catastrophe in New Orleans. I have a friend that works for FEMA and he explained to me what a furball that whole situation was at the time. Apparently government aid support and rescue was hindered for three days while the mayor, the Parish Sheriff, and the federal government bickered about who was in charge. As I watch the whole situation unfold I realized that the federal government and the state government could basically be rendered powerless in a disaster for reasons ranging from redtape to civil disobedience. That is when I decided I needed to investigate what it would take to be self-sufficient for a period of 30 days or more. Surprising the cost was quite cheap what we considered what you had to prepare for that was most probable to happen. I fully and wholeheartedly recommend that every American be prepared to the same way. Unfortunately I doubt very much that they are. My friends own a pawn shop and when I help them out on occasions I see that most people are unprepared for an unexpected bill of one or $200 let alone any type of major disruption of support services. I have a garden which I grow much of my green vegetables and root crops, because I live in the city livestock is not an option but is where I live is surrounded by natural national forest I don't perceive that to be a large problem. I sunk a shallow well have a very small generator to keep the refrigerator running. So am I a prepper I guess you could say yes or perhaps you could say I'm a normal human being just aware of his surroundings and ready to make sure my family and friends can look out for each other during hard times. During the last LA riots the korean business men teamed together to protect thier properties and only one store got burned(in the area I am thinking about ither areas that did not protect themselves got burned out) I is amazing how a few well placed shotguns and handguns turned the tide without any deaths. I will look for that video and post it if I find it. “It’s not surprising that the FBI ‘has not found any evidence’ regarding Clinton’s servers being breached," Gohmert said. "Like I stated to Former FBI Agent Peter Strzok in the House Judiciary Hearing, it was the Obama-appointed Intelligence Community Inspector General that discovered the breach. It was not the FBI that found it, so their statement was technically correct, but very deceptive in its omission." In a report published earlier this week, the Daily Caller News Foundation cited sources that said a Chinese-state owned firm located in the Washington, D.C., area had access to Clinton's emails in real time courtesy of a code embedded in the New York-based server which then made copies of the emails, some of which contained classified information. In response, an agency spokesman said: “The FBI has not found any evidence the servers were compromised." 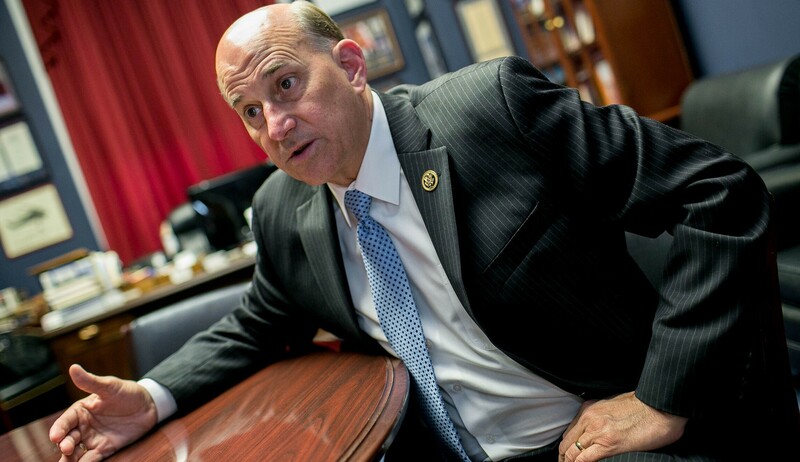 But Gohmert, who told Fox News on Tuesday that a foreign entity had obtained Clinton's emails but did not identify from which country, put out a statement that emphasized it was not the FBI but rather the intelligence community inspector general that discovered the hack. “It’s not surprising that the FBI ‘has not found any evidence’ regarding Clinton’s servers being breached," Gohmert said. "Like I stated to Former FBI Agent Peter Strzok in the House Judiciary Hearing, it was the Obama-appointed Intelligence Community Inspector General that discovered the breach. It was not the FBI that found it, so their statement was technically correct, but very deceptive in its omission. "In that hearing last month, where former FBI agent Peter Strzok had been testifying, Gohmert said intelligence community inspector general officials had informed Strok and other top bureau officials of an "anomaly" in found in Clinton's server. But Strzok, who led the FBI investigation into Clinton's emails, did not act on that information, Gohmert asserted. Strzok acknowledged the meeting took place, but did not recall what was said. He was fired from the FBI earlier this month for anti-Trump text messages he exchanged with former FBI lawyer Lisa Page, with whom he as having an affair. In his statement Wednesday evening, Gohmert suggested that Strzok and his colleagues decided not to pursue the hacked emails tip because "they knew this would devastate Hillary Clinton’s chances of being elected and they were not about to let that happen." The Daily Caller's ex-intelligence officer source said the inspector general of the intelligence community “discovered the anomaly pretty early in 2015.” The report has elicited a response from President Trump. “Report just out: 'China hacked Hillary Clinton’s private Email Server.' Are they sure it wasn’t Russia (just kidding!)? What are the odds that the FBI and DOJ are right on top of this? Actually, a very big story. Much classified information!” Trump posted to Twitter Tuesday night. Illegal immigrants tend to be even more associated with the "jobs Americans won't do" mantra. And yet there are just 24 occupations out of 474 in which illegal immigrants comprise at least 15 percent of workers. There are 5.7 million natives in these high-illegal-immigrant occupations, 67 percent of whom have no education beyond high school. But in occupations that are made up of 5 percent or less illegal immigrants, 75.5 percent of natives have education beyond high school. This suggests that the impact of illegal immigration on wages and employment opportunities will be felt most by less-educated natives. More-educated natives will tend to avoid competition with illegal immigrants. •Maids and housekeepers -- 51 percent native-born. •Taxi drivers and chauffeurs -- 54 percent native-born. •Butchers and meat processors 64 percent native-born. •Grounds maintenance workers -- 66 percent native-born. •Construction laborers -- 65 percent native-born. •Janitors -- 73 percent native-born. President Trump's name appears on dozens of buildings worldwide, but if the leader of Poland has his way, properties like Trump Tower and Trump International Hotel may soon be joined by a conspicuously named military installation: Fort Trump. williatw wrote: If Trump were to fill all existing vacancies, the only circuit that he could move from Democrat control to a tie would be the Third Circuit. There is no Circuit that he could flip from Democrat to Republican control during Trump's first term. If this is correct then with Trump having some 120 or so judges to fill, and even if successful would only flip one court. This suggest strongly IMHO that the Dems have been quietly taking over the circuit Courts (effectively the Federal courts) for probably decades while maintaining the façade of a balanced (relatively speaking) SCOTUS. The end game would have been if Hillary had won; at that point with her likely liberal SCOTUS (and other judicial picks) the Federal courts from top to bottom would have been firmly in Liberal/leftist hands for decades. It is understandable for people to focus on individual judicial nominees or particular courts, but the vast majority of decisions are made by judges who rarely make the news. 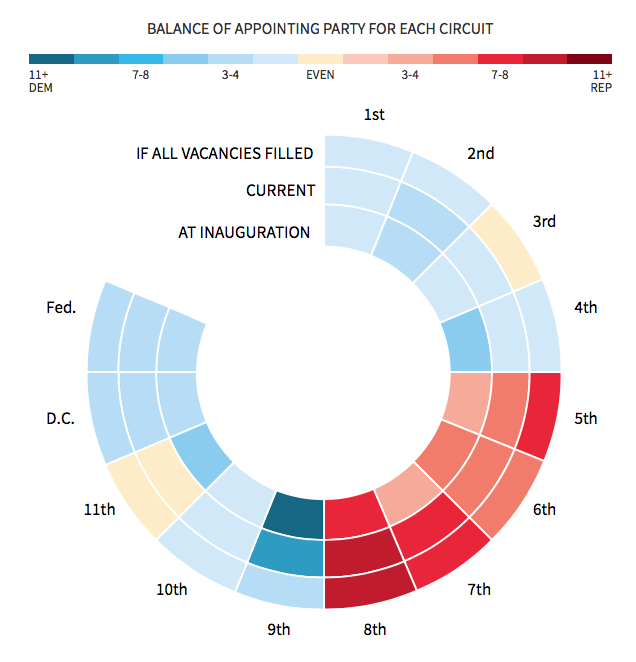 Even if Republicans keep control of the presidency and the Senate for the next six years, Democratic appointees will mostly likely still be firmly in control of most of the circuit courts of appeals in the country. Republicans are ecstatic and Democrats are livid about Brett Kavanaugh’s Senate confirmation as a Supreme Court justice. But while the Supreme Court is important, many Americans tend to exaggerate its powers. Democrats still firmly control the nation’s district courts and circuit courts of appeals, where virtually all federal judicial decisions are made. Even if Republicans keep control of the Senate in the Nov. 6 midterm elections, the balance of power on these courts isn't going to change in the next two years. The Supreme Court grants oral arguments to about 80 cases a year. The nation’s highest court decides another 50 cases without hearing oral arguments. By contrast, the circuit courts of appeals handled 51,832 cases in the 12-month period ending March 31. Consequently, the circuit courts – not the Supreme Court – have the final word on 99.75 percent of all cases. The lower-level district courts handled 363,000 cases. Whether you care about immigration, gun control, abortion or other hot-button issues, the circuit courts and district courts are where most of the work occurs. The Supreme Court generally limits itself to only those cases where there are conflicts between the different circuits. And neither Kavanaugh, Justice Neil Gorsuch, nor Chief Justice John Roberts are likely to overturn long-established precedents. Indeed, Kavanaugh and Gorsuch – President Trump’s earlier appointee to the high court – were even co-authors on a book about honoring judicial precedent. Republicans may be happy about confirming 26 circuit court judges so far under President Trump – but they still have a long way to go. Of the 13 circuit courts of appeals, Democratic appointees control eight and Republican appointees control four. One is evenly split. So far, most of President Trump's appointees (62 percent) have been replacements for retiring conservative judges. The U.S. Circuit Court of Appeals for the District of Columbia is often referred to as the nation’s second-highest court. Because all federal agencies are headquartered in and around the nation’s capital, this court oversees their decisions. Democratic appointees have a 7-3 majority on the D.C. Circuit Court, with one vacancy due to Kavanaugh's elevation to the Supreme Court. The 9th U.S. Circuit Court of Appeals has jurisdiction over California and eight other Western states that together represent over 20 percent of the U.S. population – more than any other circuit court. Again, Democratic appointees are firmly in control, with 16 judges, compared to seven appointed by Republicans. Even when conservatives have won cases decided by a three-judge panel in the 9th Circuit Court of Appeals – such as the Peruta decision that said that people have a constitutional right to protect themselves with firearms outside their homes – California appealed the decision to a larger panel of 11 judges in the circuit. This is called an en banc decision. Not surprisingly, liberals had a solid majority on the panel and overturned the earlier decision of the judges who were assigned to the case. If President Trump were to fill all existing vacancies on the circuit courts of appeals, the only circuit that he could move from the control of Democratic appointees to even a tie would be the 3rdCircuit Court of Appeals. If Democrats take control of the Senate following the midterm elections next month, they are promising to bring judicial confirmations to a halt. Five of the Democratic appointees on the 9th Circuit Court of Appeals are over 70 years old, but to flip the court Trump would have to fill all of the current vacancies and four of these older judges would have to retire. 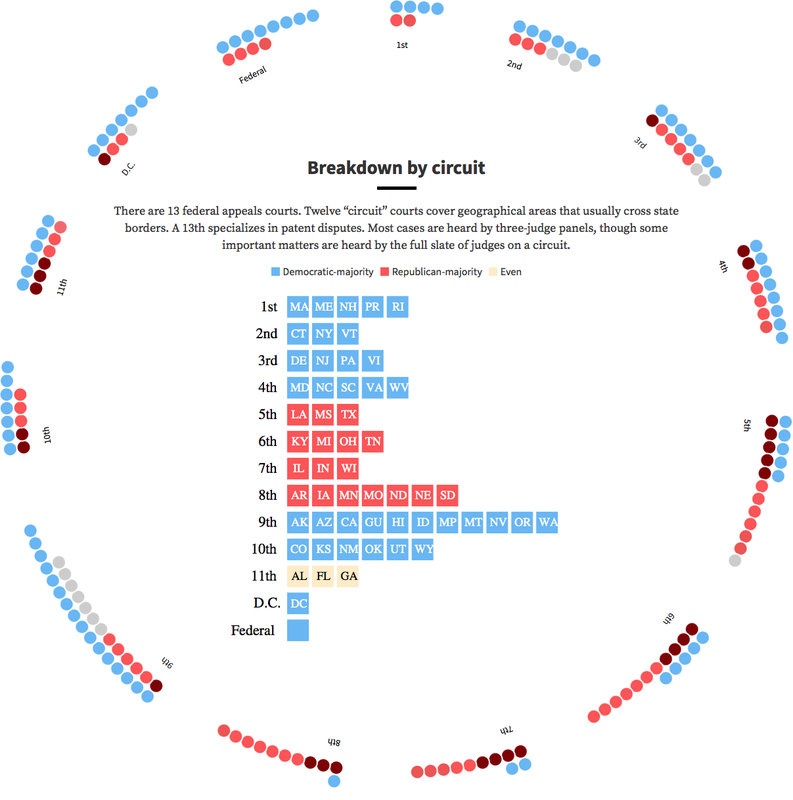 Nine circuit court judges who were nominated by Democrats are over 75 years old. In a second Trump term, Republicans might be able to flip one of the circuit courts – the 4th Circuit. Longstanding American institutions ranging from the First Amendment to the Electoral College to the Senate have been suddenly and rashly declared “illegitimate.” Why? Because, at the moment, they are keeping the Left from getting what it wants. The Left wants to silence certain right-wing critics and dissidents, and the First Amendment stops them. The Senate and the Electoral College perform their intended constitutional role in protecting the interests of the less-populous states and their residents, ensuring the protecting of minority interests from the tyranny of the majority. This annoys the would-be tyrants. (They are, to their discredit, unable to truly appreciate that political tides turn, and that majorities are fickle things.) The ordinary political processes of the United States have produced results that the Left does not like, and, hence, those processes and the institutions that enable them must be considered illegitimate. The nomination of Brett Kavanaugh to the Supreme Court is to be understood as a national emergency because . . . Democrats would prefer to have somebody else, and they believe they having something like a divine right to rule. The angry partisan cannot believe that life is good, because he must then ask himself: If life is good, then why am I not enjoying it? We were not supposed to have made it this far. George Orwell saw night descending on us in 1984. Orwell was, on paper, a radical, but in his heart he was an old-fashioned English liberal. He dreamed of socialism but feared socialists. He feared them because he knew them. I was in the sixth grade in 1984, but I remember the magazine covers and pundit panels, and the insistence that though we had not arrived at dystopia on Orwell’s schedule, that eternal jackboot was sure to find our face soon enough. Tom Wolfe joked that “the dark night of fascism is always descending in the United States and yet lands only in Europe,” which wasn’t quite right: There’s Saudi Arabia, and China, and Burma . . . But not here. And, increasingly, not there, either. As our friends at HumanProgress.Org remind us (to little thanks — nobody is less popular than an optimist) the world has in fact become more democratic and more liberal since 1984, rather than more autocratic and more illiberal. Orwell was the better writer and the more profound thinker, but Aldous Huxley was the better prophet. On the other side of the political spectrum, Willi Schlamm offered a useful proverb: “The problem with socialism is socialism. The problem with capitalism is capitalists.” There’s something to that. But the hyper-capitalist corporate dystopia of the science-fiction imagination and the socialist imagination has not come to pass. There is much to criticize about Amazon and its Cult of Fulfillment, and about Apple and Google, but they aren’t the Tyrell Corporation of Blade Runner or Weyland-Yutani, either. I do not use Facebook, but I am glad that it exists. There is a great deal about technology and culture Anno Domini 2018 that I find perplexing and off-putting, but I prefer to live in a world with wild and free innovation rather than in one that is more bland and more predictable. The catalogue of apocalypses is thick, and its contents are easy to mock. There are many who are skeptical about current global-warming claims in part because they remember that only a few decades ago we were in a worldwide panic about global cooling and the new ice age that was supposed to be descending upon us, and they are not much inclined to turn over the levers of economic and political power to the same people (or the same kind of people) who wanted to cover the polar ice caps in coal soot to stave off the frost of doom. Paul Ehrlich was sure that hundreds of millions of people would starve to death in the Seventies irrespective of any change in government policy or developments in agricultural technology. There were many horrors in the Seventies (you had to be there) but mass starvation caused by insufficient agricultural production was not one of them. Famine today is an almost exclusively political phenomenon rather than an agricultural one — starvation is man-made, famously in the case of the socialists who decided that a few million Ukrainians needed to be starved to death to clear the way for utopia. The Malthusian terror is eternal: Thanos, the big bad in Avengers: Infinity War (hey, I had a long flight home from Zurich) is a thoroughgoing Malthusian, one who dreads the depletion of natural resources and so decides to kill every other sentient being in the universe as a salubrious cull. His means may be the stuff of comic-book villainy, but his end is one that is very much shared by a great many people (including a great many who should know better) on the left and on the right captive to the fear of overpopulation. Never mind that the people who study this sort of thing are predicting a decline in world population in the near future — again, nobody likes an optimist. We did not descend into Orwellian totalitarianism. We are not under the heel of galaxy-bestriding eternal corporations. (The average corporate life expectancy is in fact in steep decline and has been for some time as our ever-more efficient markets reduce the once mighty corporation to an increasingly temporary, tenuous, and ad-hoc nexus of intelligence and capital. The nature of the firm is changing, and the tragedy is that Ronald Coase is not here to update us.) We are not starving to death because of overpopulation, and countries such as India, once identified with the Malthusian terror, are thriving. Things look pretty good at home, too. There are things I would prefer to see done differently, and some important problems that are not being treated as seriously as I would prefer. But the nation is at peace, and it is prospering. (For the most part.) Americans have developed a weird, cultish, caesaropapist attitude toward the presidency, without ever stopping to consider that the nation has thrived under the administration of a succession of very different men with very different political agendas: Ronald Reagan, George H. W. Bush, Bill Clinton, George W. Bush, Barack Obama, and, now, Donald Trump: The fact that America just keeps on trucking irrespective of the qualities or character of the man in the Oval Office ought to make us think rather less of the presidency and rather more of ourselves — and think better of our neighbors, our businesses, our public institutions, our civil society, and much else — including the citizens who do not share our political views. So why the mass hysteria? The world must be ending. It must fall to us to prevent the apocalypse. Because, if it isn’t, if life is just going on more or less the way life does, then what’s the point of all this huffery and puffery, all the public weeping and dressing up in silly costumes and cutting ourselves off from family and what friends we have? The angry partisan cannot believe that life is good, because he must then ask himself: If life is good, then why am I not enjoying it? Why do I feel so alone, so frustrated, and so meaningless? The Abyss isn’t out there — it’s in here. Sarah was killed when strong winds from the storm tore away a carport and sent it hurtling into the modular home she was in, officials said. The girl is one of at least six people whose deaths have been attributed to the storm. Mr. Radney cannot recall exactly when he got a call from his brother with the news of what had happened; he thinks it was around 4 p.m. Wednesday, but acknowledged that much of the last day or two had been a blur. The reception was bad, so Mr. Radney could not quite make out what his brother was saying. But he could tell he was crying. “When I finally got through and spoke to my mom, my mom said Sarah had been hit in the head,” Mr. Radney said. The wind, he was told, had lifted up a portable carport that had been behind the house and thrust it toward the home such that one of its legs burst through “the ceiling or the window, I’m not sure which,” Mr. Radney said. It struck both Sarah and Mr. Radney’s mother; his mother’s lung was punctured, her rib broken; the carport struck Sarah on the head, leaving her gasping for air for 45 minutes to an hour. Writing in The Week, Joel Mathis wonders what this means for . . . Donald Trump. What should we make of the time we have? What is important? What is worth it? There are answers out there, and they are not associated with hash-tags or summarized in The Week. If you are going to stand in a crowd of like-minded people, chanting, what are you going to chant about? If the answer is a politician, then that’s no answer at all. WASHINGTON—President Trump said he wants to sign an executive order that ends the automatic right to citizenship for anyone born in the U.S., ratcheting up his election-season remarks on immigration with a proposal many legal scholars said is unconstitutional. In an interview published Tuesday morning, just ahead of next week’s midterms, Mr. Trump said he planned an executive order to end what is known as birthright citizenship, bypassing Congress and waving off the belief of many legal scholars that such a move would require a change to the Constitution. Constitutional scholars dismissed the idea, saying a president has no legal standing to end birthright citizenship with an executive order. “It’s basically saying the president is above the Constitution,” said Laura K. Donohue, a senior scholar at the Georgetown Center for the Constitution. The White House didn’t further explain Mr. Trump’s assertion that he alone could make the move, and it didn’t provide further details about the scope of the proposed executive order or the timing. Trump's legal argument for overriding the common interpretation of the 14th Amendment and the INA, both ratified by Congress, will most likely amount to challenging whether unauthorized immigrants to the US are subject to US jurisdiction, a clause included in both the 14th Amendment and the INA. This will almost certainly end up before SCOTUS; the current practice of "multimillion-dollar "birth tourism" business" is what is fueling this particular fire not Trumps's alleged "bigotry". RBG once made the statement the only way she would leave the Supreme Court would be feet first. I believe her. She may well. Returning cancers tend to be increasingly aggressive. A sad thing no matter how you look at it, or your political persuasion. Tough process for all involved. If it is true, I feel for her, her family, and friends. I guess we will see if it is fake news or not, soon enough. "What I did, basically, was to convey that I respected his authority, but that he didn’t intimidate me. It was a delicate balance. Like so many strong guys, Dobias had a tendency to go for the jugular if he smelled weakness. On the other hand, if he sensed strength but you didn’t try to undermine him, he treated you like a man."